A plant collector, park manager and park designer. John Gibson was born in Cheshire and apprenticed to Paxton at Chatsworth. 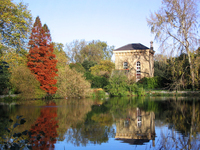 After an expedition to the East, John Gibson became manager of Victoria Park in 1849, of Greenwich Park in 1851, of Hyde Park and the central Royal Parks in 1871. John Gibson re-designed Ranelagh Gardens and Battersea Park.